On Friday, I showed you all an updated tour of our home, 3 months into our one year here in Kansas. 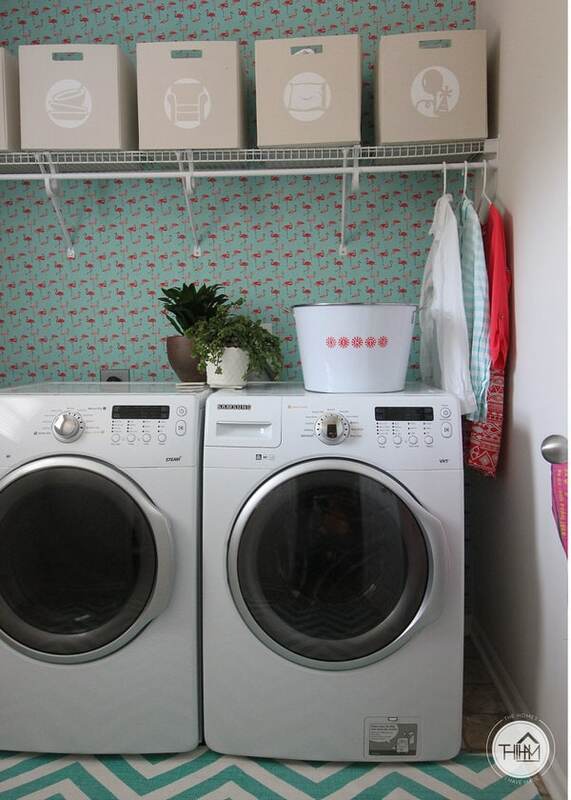 I gave you a sneak peek of our laundry room, and today I am back with the full reveal! 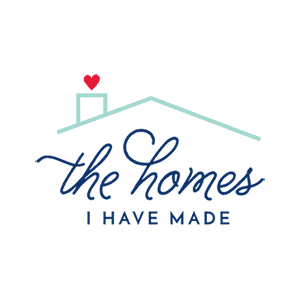 I learned in the last house that I really shouldn’t say “final reveal” here on the blog until I am doing our final home tour right before we move. Because even though I say things are done, I usually find myself making tweaks here and there as time goes on, and then I have to go back and tweak old posts. 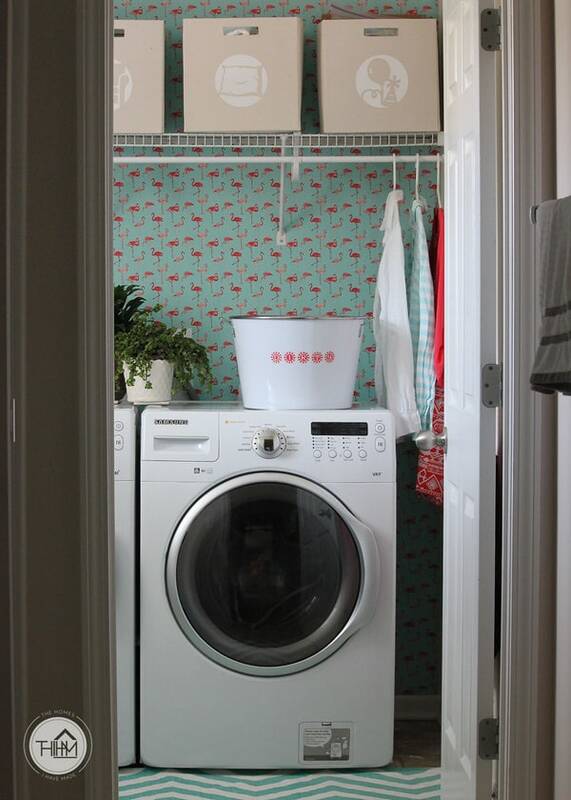 So…I think this laundry room is done, but only time will tell on that one! 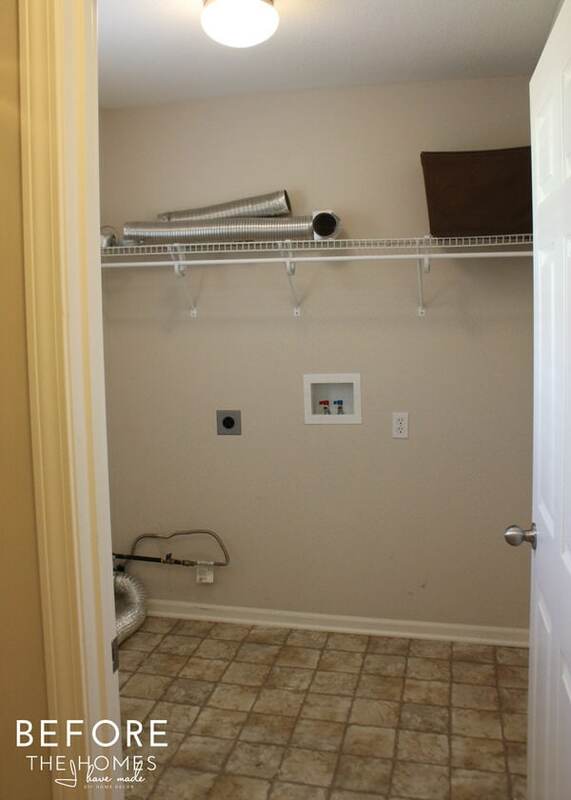 Here’s our laundry room the day we moved in. It’s a decent size – I’d say about 5×9′ and even has a single little window. Our only complaints about the room are that it is through our downstairs bathroom and doesn’t have a wash sink/counter (we got so spoiled by that in our last house!). Still, it fits our machines and has a shelf for storage, so it will definitely work for the year! It’s bright and fresh and cheery and just so darn fun to be in. I certainly don’t love laundry days, but thanks to the flamingos on the wall and some other simple updates, I find myself looking for excuses to walk back in there and check it out. 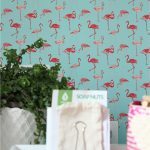 I’ll tell you more about the flamingo “wallpaper” next week as part of my Renter-Friendly Walls series, but I’ll give you a tour of the other functional and decorative changes I made in here today! Since we don’t have a counter, we were lacking a good landing spot for our laundry supplies. In an effort to keep from mounting anything else to the wall, I transformed a rolling toy cart from Target into a rolling laundry cart! Thanks to the addition of Duck tape and a handle, it matches the rest of the room and slides right into the empty space between the machine and wall! 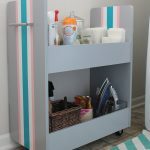 You can read more about how I made the laundry cart here! I like that our machines fit in the space with enough room to hang items on either side for drying. I also re-purposed one of our metal wash buckets to hold dirty dish towels, cloth napkins, and rags throughout the week. 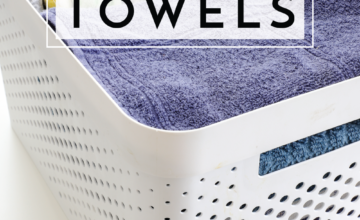 Now this wet laundry doesn’t have to sit in our hampers, and when it’s time to run a load of wash, we can throw the rags and towels right in! The “dirty” label is actually made from rub-on letters that I bought years ago! 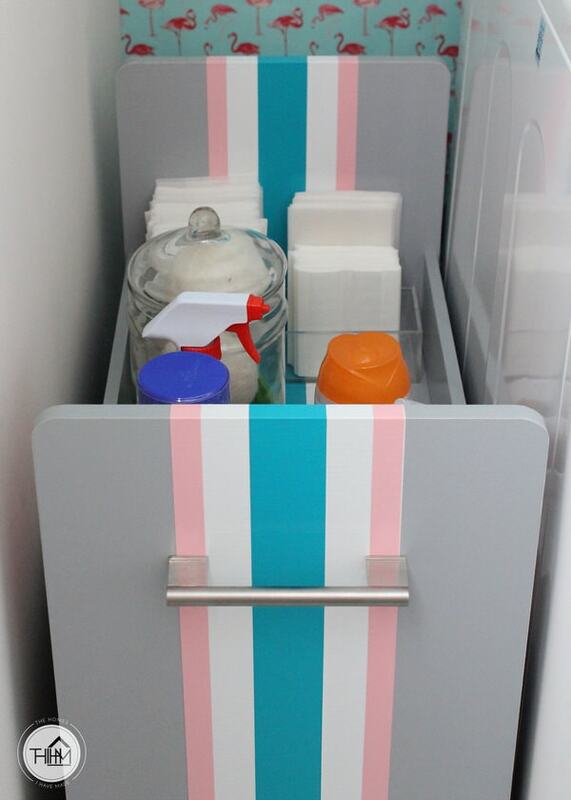 They matched perfectly, and I loved being able to use something already in my stash for this simple little detail! Lastly, I put a flat-woven rug, also from my stash, on the ground to cover up some of the unsightly and ripped tile on the floor. Admittedly, I put it down just for the GlobeIn Laundry pictures, but loved it so much it has stayed! All together, we now have a super sweet place to sort and do laundry, don’t you think?!? As you look through the bathroom down into the laundry room, this is the view that greets you! 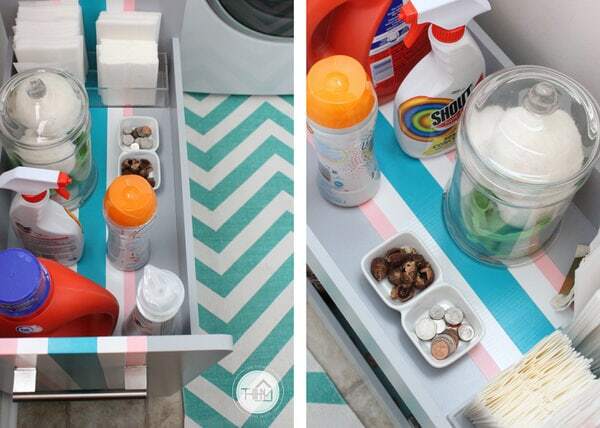 Wouldn’t you want to scoot in and do some laundry too? If there’s anything I left out and you’re curious, just let me know and I’ll get back to you! So tell me! What’s your favorite elements? 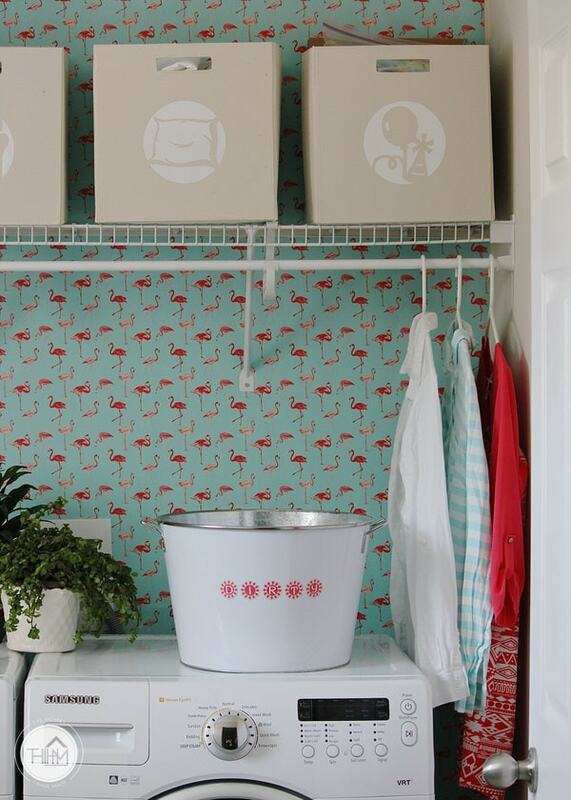 Am I crazy to “wallpaper” my laundry room with flamingos? I’d love to know what you think below! Have a happy Monday! 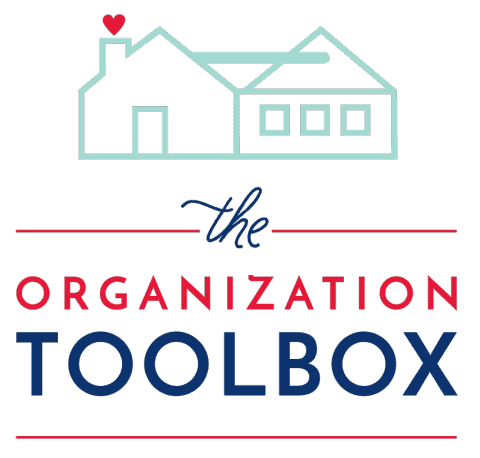 See you back here Wednesday for my next Thriving & Surviving Military Life post! 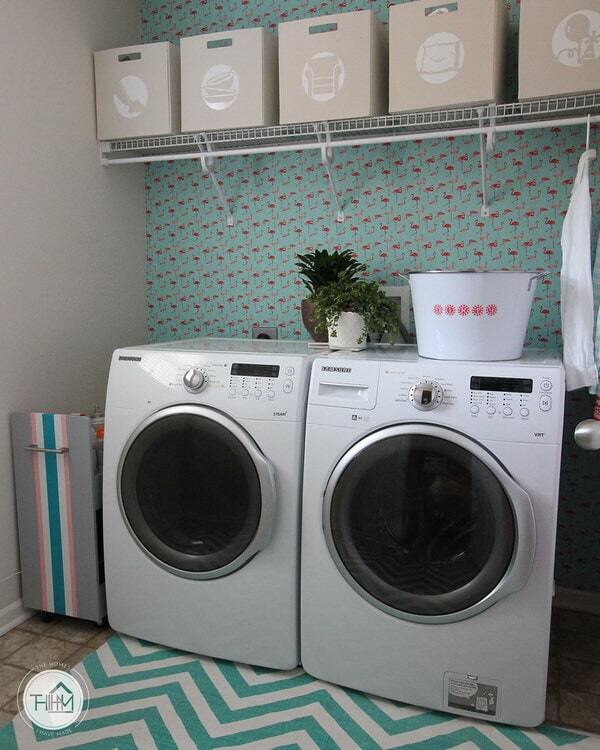 I am head over heels in love with your laundry room! I would go in there just to look at it too. Your Kansas home is so glam, and this room is the cherry on top. I’m pulling a bin out for our vacuum parts today. I don’t know why I never thought of that. They are scattered between three closets in our place. ? Thank you SO much!!! This comment last week totally made my day! Sometimes I feel like I just do the craziest things, but you all seem to love the flamingoes as much as me, so maybe I’m not crazy after all!! 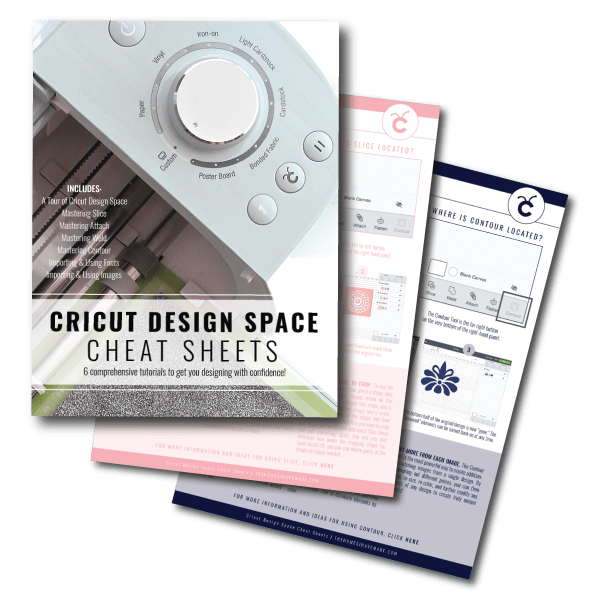 Glad I could provide a simple solution for your vacuum parts – there are so many times I wait too long to make a simple change that makes a huge difference, lol! I love the flamingos. Personally I say whatever works for you and your family and makes a room more pleasant to use is a positive thing! Bonus points for it being renter friendly. Thank you so much Dee! Glad you love it like I do! 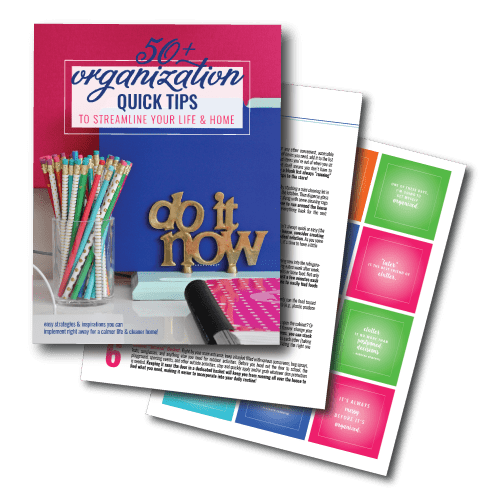 I’ll be sharing how I did it tomorrow on the blog, so keep an eye out! I love this. I am not a huge fan of laundry, the waiting and folding drives me crazy. But this little room is so inviting. How could you not have a smile on your face as you went in and did some laundry? Thanks so much, Kristie! I’m so glad everyone loves the flamingos as much as me. You guys know I tend to act on whims, but this one paid off big time! I LOOOOVE that little room! I’ll stop filling your inbox now 😉 Have a good rest of the weekend! 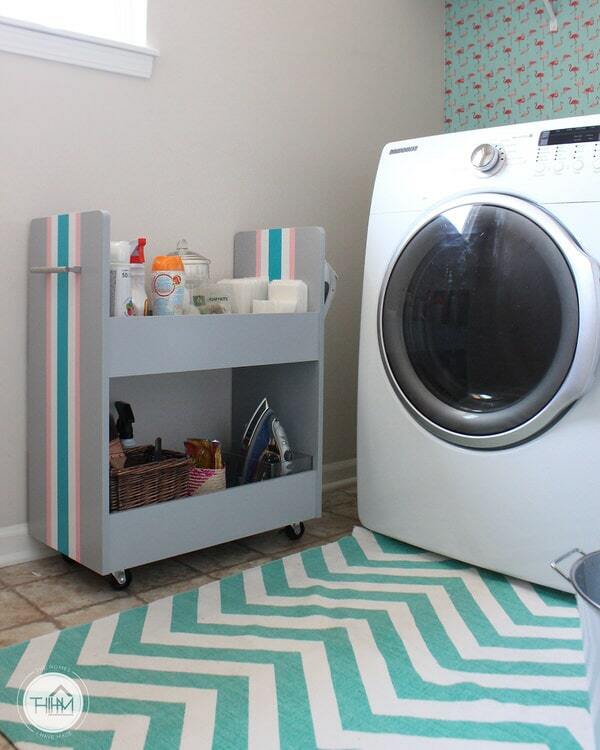 Your laundry room is adorable! Love the colors and the overall feeling of whimsy. Top scores on functionality, too! Thank you so much! Glad you love it, and thanks so much for pinning and tweeting about it – that means a ton! Definitely not crazy. Papering with walls with a print that makes you happy every time you see it is super smart. The more you like being in there, the easier it is to get the job done! I made my computer desktop image special for the same reason…I’m more likely to go over and get my work finished if I get a little cheerful eye candy as a reward. 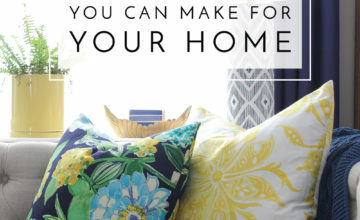 Can’t wait to learn how you did it and made it renter-friendly! Thank you!!! Glad to know I’m not crazy or silly for doing something so whimsical to our walls, lol! The computer desktop is brilliant – copying now 😉 I’ll have the tutorial for the flamingo “wallpaper” up tomorrow so keep an eye out for it! Thanks for writing, and hope you have a great rest of the weekend! 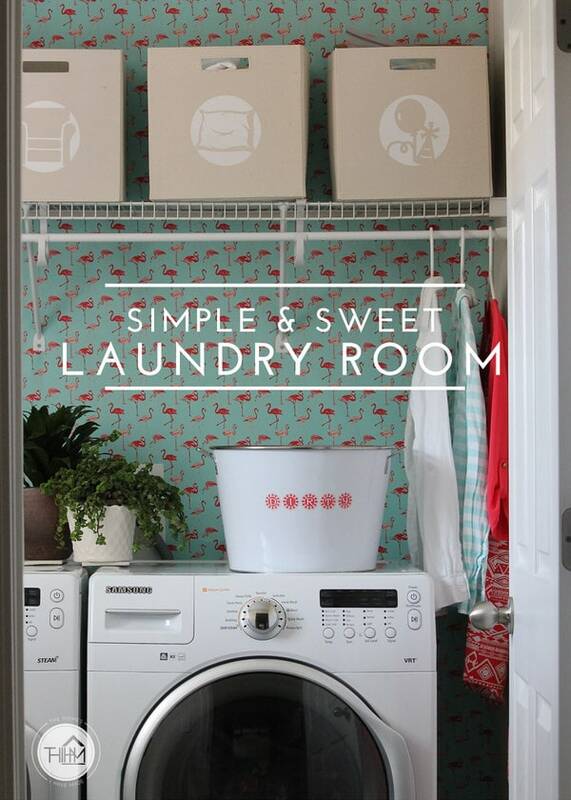 Love the whimsy of your laundry room, you have Midas’ touch of gold. 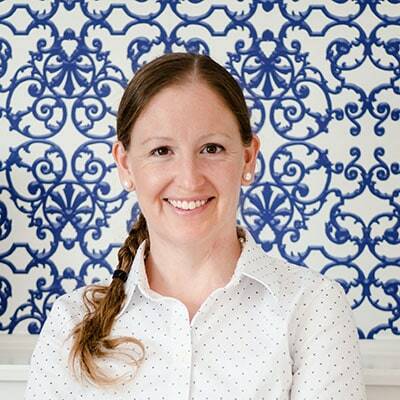 I have loved what you do to your rooms and your willingness to try something. Also thank you for the last post of the soap nuts and the wool dryer balls. I purchased both and absolutely love them. I will be giving a set to my girls as a stocking stuffer for Christmas! Thank you so much for this super sweet comment! Not sure about a touch of gold 😉 but I am willing to just give things a try and see how they turn out. Lucky for me, I think this one was a home run!! 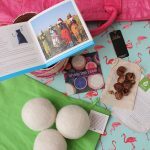 I’m so thrilled to hear you bought the laundry balls and soap nuts – I love them too. 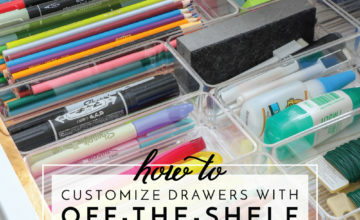 And what a GREAT idea for stocking stuffers! Why didn’t’ I think of that! Thanks so much for sharing and hope you have a great rest of the weekend! 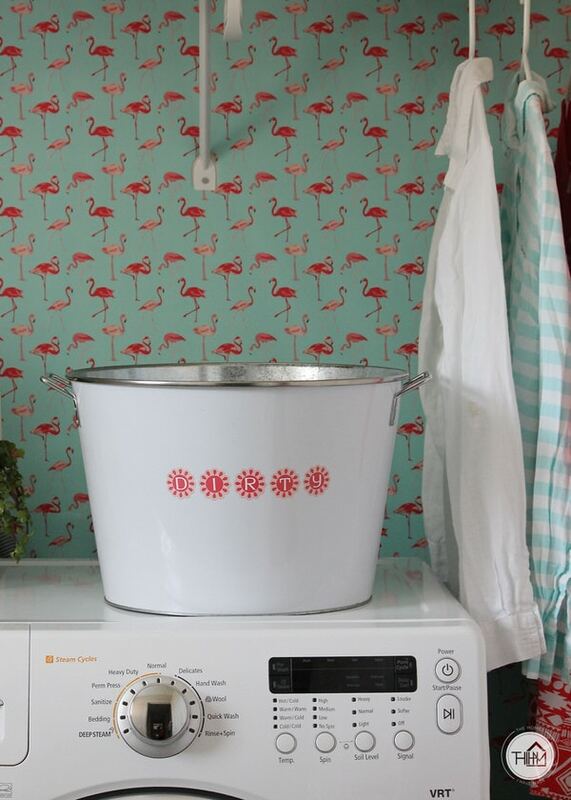 I think that the laundry is the PERFECT place for flamingos! Years ago I painted our laundry closet purple. It’s not a color I’d ever consider for a room proper, but 7+ years later it’s still making me smile when I open the bifold doors to throw another load in…and anything that can make you smile during laundry is worth it! Amen!! I love having pops and pattern in unexpected places – so glad to know I’m not the only one showing our laundry room a little love! Thanks for sharing and hope you have a great weekend! So darn cute! This makes me want to go and flamingo my laundry room wall too! Thank you so much – I know, I just love them! Who knew flamingoes in the laundry room would make me so happy! I LOVE this wallpaper, it is my favorite. 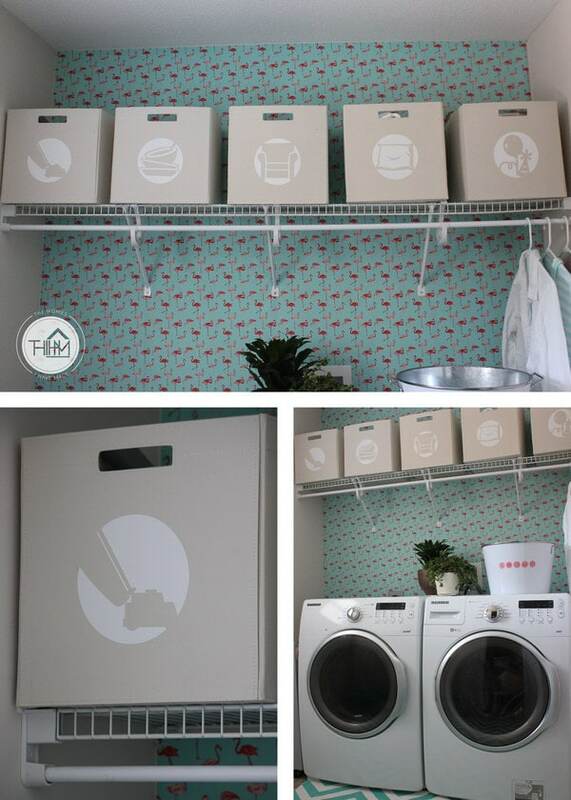 Who wouldn’t want to do laundry in that space? I know I would, it’s so fun and eventful. Great job! Appreciate your dedication to the blog and leaving comments! It means a lot! Hope you’re having a great weekend! I had a great weekend hope you had the same!